Bigdata algorithms, data analytics, simulations for hightech industries... isn't it strange, that the most demanding products today are still developed with C++ tools from the last century? What is common for general business software now becomes possible for technical application development. 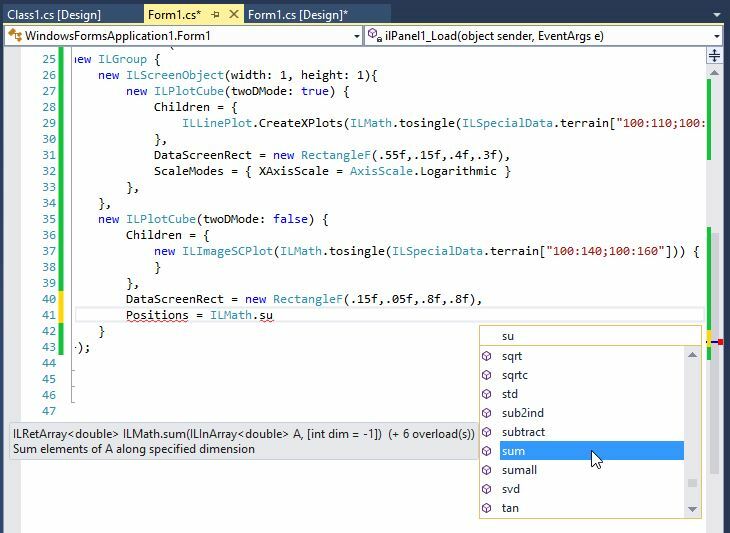 ILNumerics Ultimate VS turns Visual Studio into a first class IDE for scientific computing and interactive visualizations. 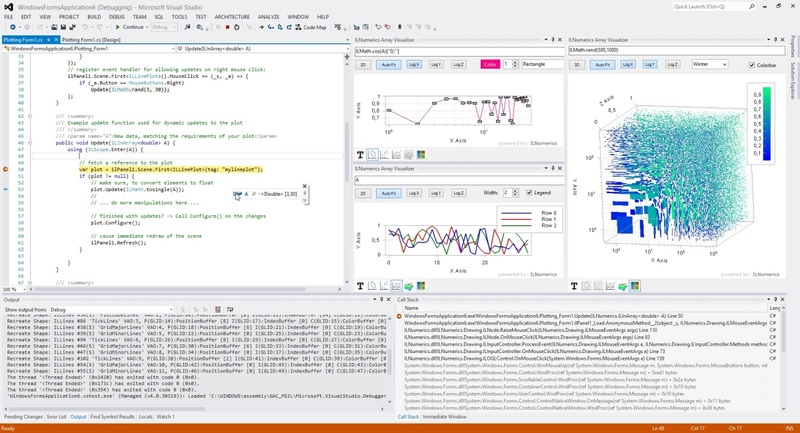 With our matured Visualization Engine, we were able to bring even more overview to your debugging session. The ILNumerics Array Visualizer today extends Visual Studio and allows to evaluate arbitrary expressions from the current debug session. It visualizes your managed and unmanaged data in several interactive ways, following updates after each debug step automatically. 1. 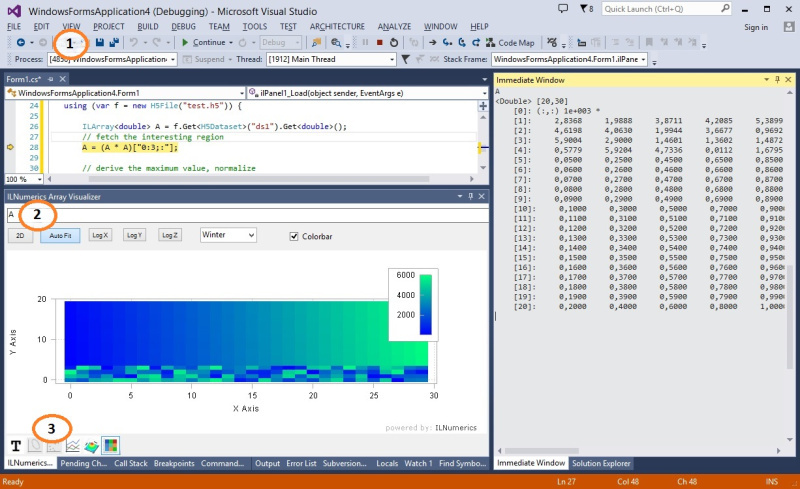 During your Visual Studio debug session go to VIEW -> Other Windows -> Array Visualizer. 2. Enter any valid expression in the textbox of the Array Visualizer Window. 3. 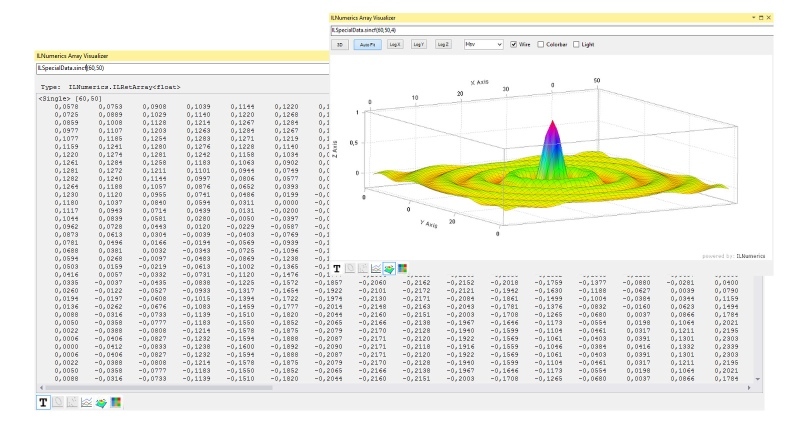 Select and configure the output type from the list of available 2D and 3D plots. The Array Visualizer handles all expressions yielding an array type: ILNumerics arrays, plain .NET System.Array, C/C++ arrays, -pointers and dynamic arrays from the std:: namespace. This collection will constantly be extended to support even more data types and languages. We made it really simple for you to get started using ILNumerics in your projects. All it takes is to install ILNumerics Ultimate VS, fire up Visual Studio and add a new predefined ILNumerics item to your project. 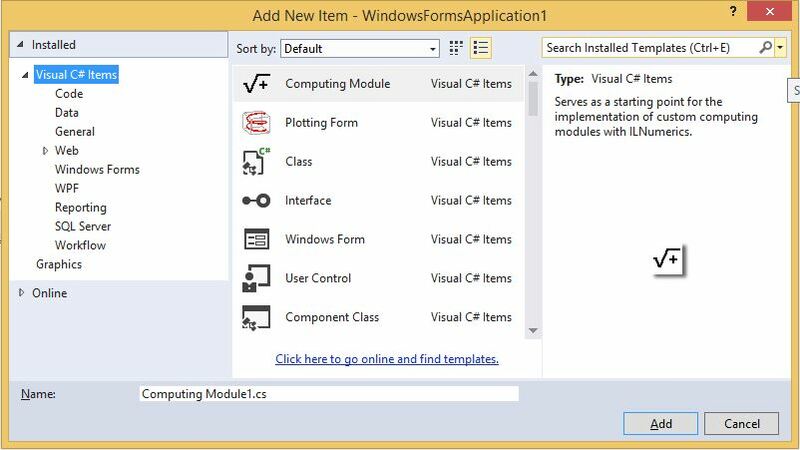 Computing modules and visualization forms are created with no effort. There is no need for you to handle any references or provide access to native binaries. It is all there and working! 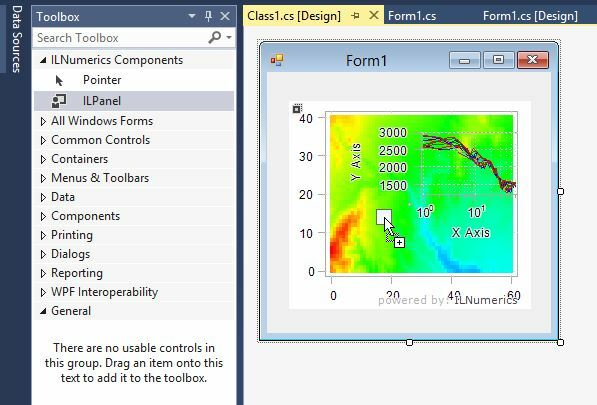 Panel - the main surface for our Visualization Engine is now readily provided in the ILNumerics section of the Visual Studio Toolbox – ready for getting dragged onto your forms. This is all it takes to set up your application for stunning 3D visualizations! Panel is based on Windows.Forms and OpenGL / GDI++. It has also been successfully implemented in WPF applications. Every SW developer should have a right for Intellisense! Once you know it - you cannot do without it anymore. Intellisense has changed the way we learn new APIs today. Of course ILNumerics fully supports Intellisense for Visual Studio. It provides you with the most useful options you have in the current context, method names, parameter infos, context sensitive help. Only one reason for the enormous increase in efficiency. But certainly an important one.